I found one some time back at an antique store. It was complete with the box and instructions, which clearly told the purchaser how to tie it for each month of pregnancy. This concept is very foreign to me. I'm no expert but I THINK (hope, HOPE) this is more of a practicality issue as opposed to a fashion statement? I thought I remember reading somewhere that pregnant women used to not be allowed of the home because it was thought to be indecent. I hope that's what it is and not out of vanity. And maybe it was about fitting into your old clothes as long as possible. And then when you became too big you stayed home? I'm gladI'm not the only one. 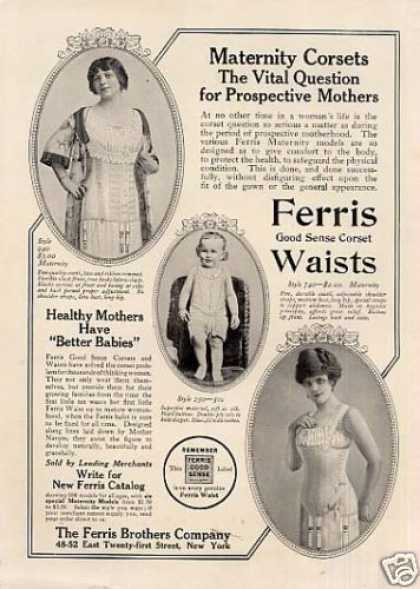 Wish that maternity jumpers would come back so that bumps would go back to obscurity. Just not a pretty sight, on anyone! Yowza! What a scary contraption. 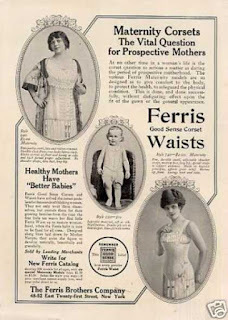 Maybe the maternity corset offered some back support as well?